A thump on the kick drum lurches a restless audience to its feet. A light jingle on the wind chime sends hands flying in celebration. An opening twang on the guitar and a sweltering, unified scream washes away thoughts of the outside world. Harmonized vocals fill the room and the ride begins. It’s “The Chain,” the first of a 24-song set from the Rock and Roll Hall of Fame group Fleetwood Mac, playing Des Moines for the first time since 2015. An estimated 10,000 journeyed through spitting October snow to see the famed outfit perform at Wells Fargo Arena, Iowa’s largest indoor stage. The show made its Des Moines stop in the first month of a tour where fans won’t see longtime songwriter and guitarist Lindsey Buckingham belting classic Fleetwood Mac choruses. The band fired Buckingham earlier this year, and, in response, the songwriter filed a multi-million dollar lawsuit against his longtime bandmates. Neil Finn of Crowded House fame and Mike Campbell, longtime Tom Petty and the Heartbreakers guitarist, took Buckingham’s place in Des Moines, where Fleetwood Mac offered Iowans a two-and-a-half-hour set spanning five decades of haunting, blues-infused songwriting. Off stage, headlines of a $12 million lawsuit and the internal discourse that caused it surround Fleetwood Mac. But, on stage, the group appears unflinching in celebrating its time-tested catalog of classic rock. World turning with a new lineup: So, it’s not completely the original band. But that’s what to expect with classic rock in 2018. John Mayer gigs with members of the Grateful Dead. Axl Rose filled in on vocals for AC/DC. Vince Gill’s circling the world as a member of the Eagles. Just last week, Nirvana’s surviving members reunited with Joan Jett and Deer Tick’s John McCauley singing Kurt Cobain lyrics. If you want to celebrate “The Chain” and “Don’t Stop” and “Little Lies,” you’ve got to be OK with a little fantasy draft rock ‘n’ roll. Plus, it wouldn’t be a Fleetwood Mac tour without a little drama, right? A brilliantly entertaining guitarist, Campbell fits smoothly into the group. He’s flashy when the set need flash, like 1969’s “Oh Well” or show rarity “Black Magic Woman,” but his playing mostly compliments the band’s best songwriting. 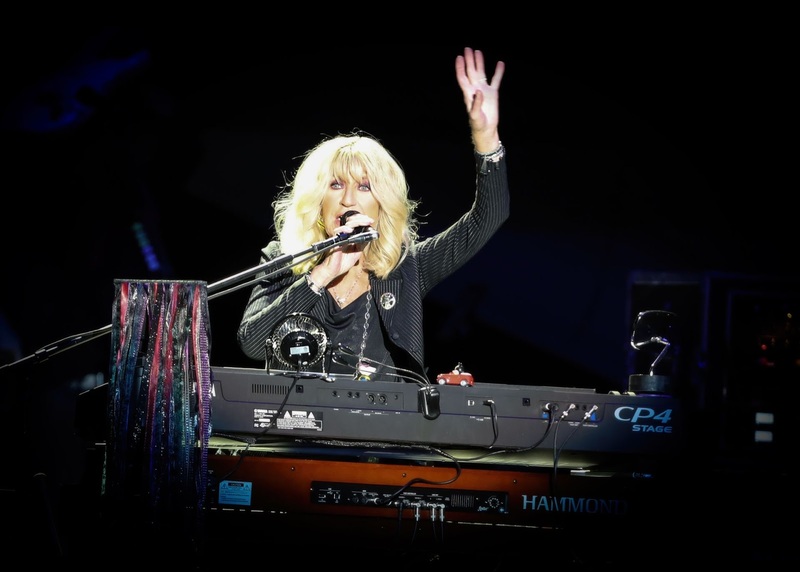 He adds a notable touch on numbers such as “Second Hand News” and “Gold Dust Woman” without hijacking the spotlight from Nicks or keyboardist Christine McVie. Finn’s a fine substitute on vocals, adding a hearty kick to iconic Buckingham lines in “The Chain” and “Go Your Own Way.” And it’s a complete blast to watch he and Nicks feed off each other — and surprise the audience — during “Don’t Dream It’s Over,” a cover of Crowded House’s biggest track. Say you love the setlist: Backed by five additional touring members, Fleetwood Mac balanced can’t-be-missed-hits with a sprinkling of rarities dating back five decades. A free fallin’ return: McVie reliably led “You Make Loving Fun” before Nicks and Finn brought the initial set to a close with an eerie “Gold Dust Woman” and energetic “Go Your Own Way,” respectively. Photographs of Nicks, Campbell and Petty flashes across the arena’s megascreen during the tribute. The band brought out one more hit,” Don’t Stop,” before closing with a Nicks-McVie duet, 1995’s “All Over Again” — a subtle nod to what waits off stage.